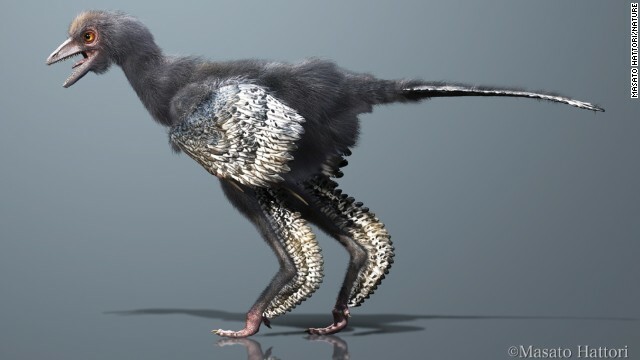 A dinosaur from the Middle-Late Jurassic period, found in China, gives scientists new understandings of how birds evolved, according to a Wednesday report from the journal Nature. The newly discovered species is called Aurornis xui. "Aurora" is Latin for "daybreak" or "dawn." Ornis is Greek for "bird." The last part of the name, xui, honors paleontologist Xu Xing. The dinosaur lived about 150 million years ago, said Pascal Godefroit, lead author and researcher at the Royal Belgian Institute of Natural Sciences in Brussels. 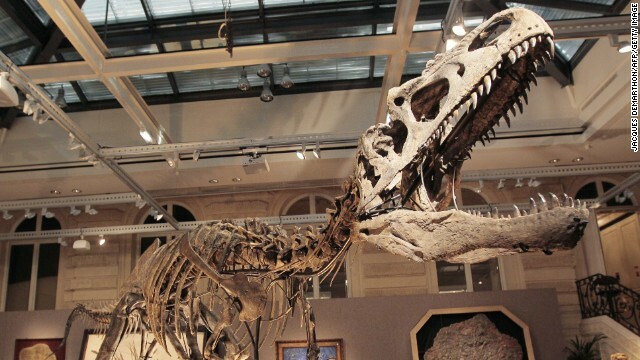 An allosaurus dinosaur skeleton is displayed at Sotheby's auction house in Paris in 2010. A dinosaur species called allosaurus had neck muscles that allowed it to whip its head back and forth while attacking prey, a new study in the journal Palaeontologia Electronica suggests. Researchers led by Ohio University paleontologist Eric Snively created a three-dimensional model of the dinosaur bones based on CT scans, and figured out what the muscles must have been like. They examined a specimen called Big Al, about 150 million years old. 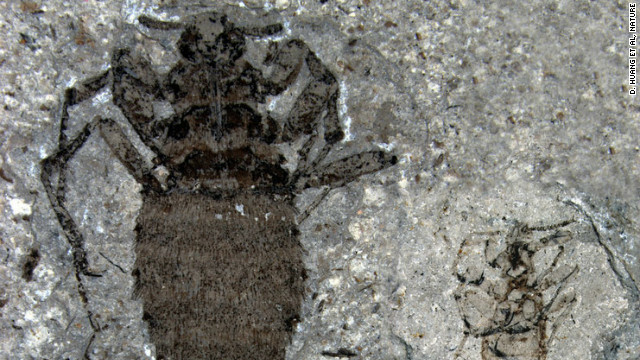 Scientists found these fossilized fleas from the Middle Jurassic. The one on the left is female, the other male. When feathered dinosaurs roamed the Earth, so did giant fleas that sucked their blood. Scientists have found the fossils of these fleas in China, and published a study of them in the journal Nature. They are about 165 million years old, making them the oldest fleas ever found. Research published Wednesday in the journal Nature shows how scientists at the University of California, Berkeley developed an active “tail” for a robotic car called Tailbot. When Tailbot jumps a ramp, its tail stops it from pitching forward and tumbling end-over-end to the ground. Tailbot is just the latest step forward in the area of bio-inspired robotics, says chief researcher Bob Full, professor of integrative biology. 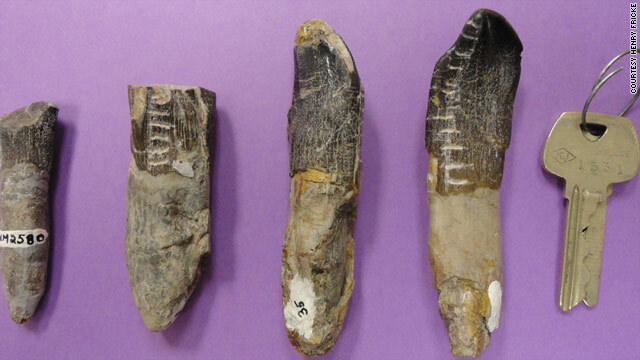 These dinosaur tooth fossils have horizontal marks where enamel was removed for analysis by Colorado College researchers. Like many birds and mammals today, ancient plant-eating dinosaurs migrated hundreds of miles each year as seasons changed, according to a study published online Wednesday by the journal Nature. Scientists have long suspected that camarasaurus - a 50-foot-long, 20-ton dinosaur that lived 145 million years ago during the late Jurassic Period - migrated. But what really surprised scientists was how far these big lizards walked: a six-month, 186-mile trek from lowlands to the mountains and then back again. "That's a lot of walking to do over the course of a year," said the study's lead scientist, Henry Fricke of Colorado College. The research touches on key questions among dinosaur experts: How did these giant beasts behave, and why were they so big? Fossilized teeth and chemicals called oxygen isotopes may have unlocked a few clues. Fricke and his team spent four years analyzing oxygen isotopes in fossilized camarasaurus teeth found in Wyoming and Utah. Here's a basic idea of how it worked. Water across the ancient landscape contained specific ratios of two isotopes: oxygen 18, which has eight protons and 10 neutrons in its nucleus, and oxygen 16, which has eight protons and eight neutron in its nucleus. Researchers were able to track locations where the dinosaurs drank their water by examining the isotopes built up in the fossilized tooth enamel, like a "tiny tape recorder of what animals were drinking," Fricke said. From this data, scientists tracked the dinosaurs from lowlands in what is now Wyoming and Utah to mountainous regions to the west. 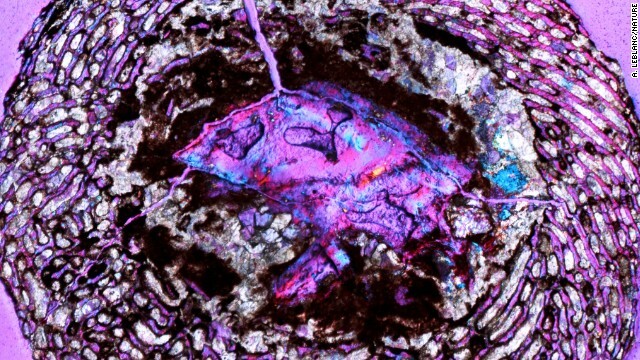 Scientists blame huge clashing asteroids for wiping out Earth's dinosaurs 65 million years ago. 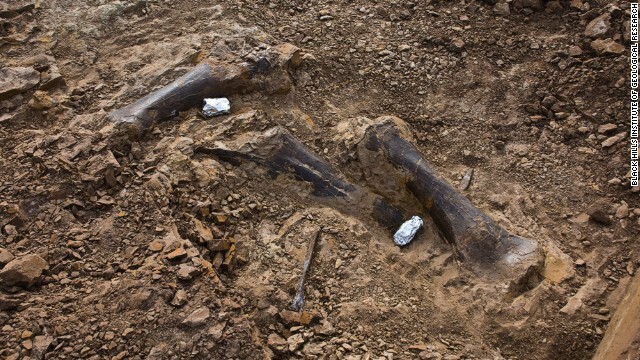 (CNN) - A 65-million-year-old murder mystery just got a bit more mysterious. Which "family" of asteroids killed earth's dinosaurs? New data from NASA's orbiting Wide-field Infrared Survey Explorer (WISE) throws doubt on a 2007 theory that blamed the death of the dinosaurs on fragments from an asteroid family called Baptistina, located between Mars and Jupiter. 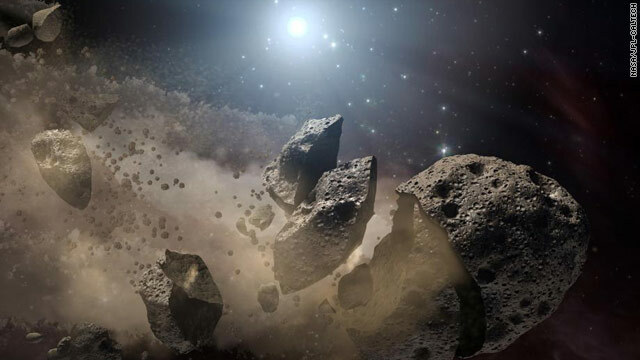 Baptistina was a huge asteroid which crashed into another space rock millions of years ago, sending mountain-sized pieces flying in various directions. These 16 clumped feather barbs were found encased in amber in Canada. We don't know exactly what dinosaurs looked like, but feathers discovered in 80-million-year-old amber provide new clues. 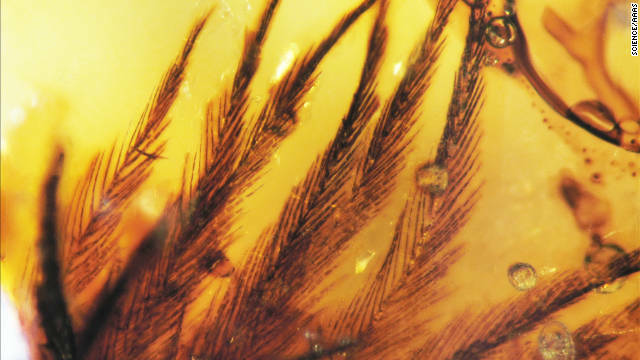 Paleontologists made this discovery of feather specimens near Grassy Lake in southwestern Alberta, Canada, and described the results in the journal Science.